The fourteenth annual Glasgow Film Festival finished on a high this weekend as it celebrated record-breaking attendance and a bumper crop of World Premieres made in Scotland. Its opening weekend saw top talent such as Karen Gillan, David Tennant, Lynne Ramsay and Imogen Poots grace the GFF red carpet as admissions across the opening seven days were up 9% on 2017. On Saturday 24 February, Glasgow Film Theatre enjoyed 2,276 admissions, a new single day record for the venue outwith FrightFest. The festival team worked tirelessly to ensure that GFF18 remained operational during the Beast From The East storm and ended with a weekend of high-profile guests including Gemma Arterton and Ben Wheatley and sell-out screenings, including the return of the ever-popular FrightFest and the World Premiere of Douglas King’s Glasgow-set dystopian rom-com Super November. Home-grown talent continued to shine as the festival closed tonight with the Gala World Premiere of Felipe Bustos Sierra’s rousing documentary Nae Pasaran. The Scottish-made feature tells the incredible true story of the East Kilbride factory workers who defied a dictatorship from the other side of the world by grounding half of Pinochet’s air-force in the 1970s. 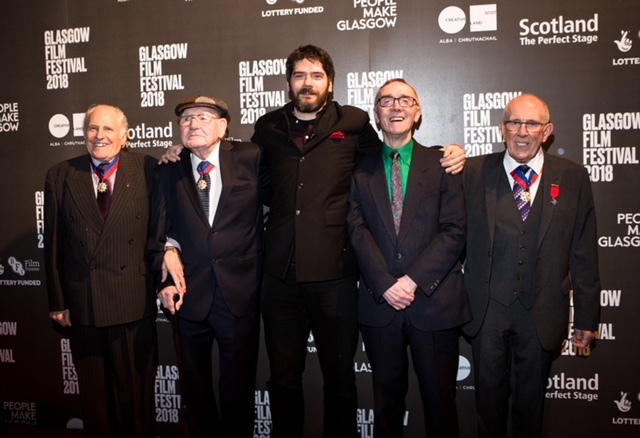 The workers themselves – Bob Fulton, Stuart Barrie, John Keenan and Robert Somerville – were all in attendance at the World Premiere along with Felipe. At the closing gala, Xavier Legrand’s compellingly tense Custody was named the winner of the GFF18 Audience Award – voted for by GFF audiences out of a shortlist of ten festival films by first and second-time directors. Custody will be released in cinemas across the UK from 13 April by Picturehouse Entertainment. Glasgow Film Festival will be keeping the festival magic alive as GFF18 on Tour brings four of its most popular films to cinemas across Scotland later in the year: Nae Pasaran, the crowd-pleasing The Divine Order, Maggie Smith in Muriel Spark’s classic The Prime of Miss Jean Brodie and Brimstone & Glory, the stunning documentary about Mexico’s jaw-dropping National Pyrotechnics Festival. The dates for Glasgow Film Festival 2019 have been confirmed as Wednesday 20 February to Sunday 3 March. The fourteenth annual Glasgow Film Festival ran from 21 February – 4 March 2018.
Notable guests visiting the festival in recent years have included Richard Gere, Alan Rickman, Joss Whedon, Terry Gilliam,John C Reilly, Saoirse Ronan, Richard Dreyfuss, Jonathan Glazer, Richard Johnson, Gemma Arterton, Ben Wheatley, David Tennant, Cliff Curtis, David Robert Mitchell, Carol Morley, Gemma Jones, Jason Priestley, Neil Jordan, agnés b., Armando Iannucci, Jack O’Connell, Dexter Fletcher, Peter Mullan, George Sluizier, Peter Capaldi, Ty West, Richard Ayoade, Eli Roth and Jean-Pierre Jeunet. The 2017 festival featured the red carpet world premiere of DavidTennant’s Mad To Be Normal and logged over 41,000 admissions, cementing its reputation as one of Europe’s major film festivals. The fifteenth annual Glasgow Film Festival will run from Wednesday 20 February to Sunday 3 March. Custody will be released in cinemas across the UK from 13 April by Picturehouse Entertainment.